Buy Cheap 3DQuickMold 2014 Online. 3DQuickMold® is a professional plastic mold design solution. The prime objective of developing 3DQuickMold® is to solve very complicated plastic mold design problem. 3DQuickMold® follows the industrial practices and use the same workflow in mold shops. The ease of use and powerful mold design capabilities have been verified by the early users of 3DQuickMold®. With the introduction of 3DQuickMold® in the market for less than two years, 3DQuickMold® is leading in market acceptance and growth rate in the market. 3DQuickMold® makes itself stand out from the competition in the mold splitting functions and the ways it guide mold engineers to complete the design task. Mold Splitting Mold design engineers spend a big ratio of the design time in Splitting Mold. 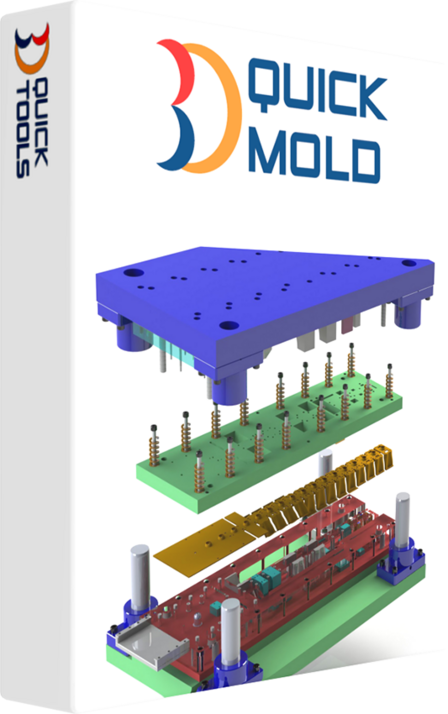 3DQuickMold® combines the experience of mold makers and the powerful modeling functions of SolidWorks® and results a very fast and direct mold split feature in the system. Flexible Workflow 3DQuickMold® allows mold designers to choose multiple workflows. User may choose top-down or bottom-up approach. Top-down approach allows user to do core and cavity layout, selection of mold structures, before the mold split operation. High Performance 3DQuickMold® is capable to handle very complicated and complex mold structures with all the details of mold splits, ejectors, cooling channels, and electrodes without scarifying the performance expectation of plastic mold designers.